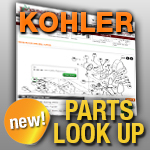 The proper fuel to air mixture is important for safe operation of your Kohler 4-cycle engine. A clean small engine carburetor, free of build up, that is properly sealed is a key part of this process. If you find your Kohler small engine is running hot, stalling, or bogging down, you may need a small engine carburetor adjustment. Let Jack’s supply you with replacement parts for your small engine carburetor repair. Choose a category below that best fits your needs to begin!